What is Adsense Publisher Toolbar? 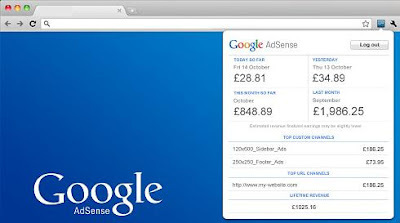 The Adsense Publisher Toolbar is extension of Google Chrome browser which can show you a snapshot of your AdSense account performance as a widget in the corner of your browser window. It also includes ad overlays that describe the recent performance of specific ad units, and gives you the option to access AdSense directly. How to Install AdSense Publisher Toolbar in Chrome? The AdSense Publisher Toolbar gives AdSense publishers two easy ways to access real-time information about their accounts and the ads served on their websites. Install Adsense Publisher Toolbar directly from Chrome Web Store. How to Turn off Automatic Updates in Windows? How to Use Old Blogger Interface? What is IPv6? When IPv6 is Launching? What is Quick View in Google Search ? Open Office - How to Get Open Office for Free ? How to Make Widgetbox for Your Website ? What is Meaning of Domain Name Backordering ?